And I have found that I just can’t. Coffee shops in sports stores. Just no. Please, God, no. Yes, I know that my response is overly dramatic and extreme, but I have visited many a coffee shop, and these coffee/sport hybrids are, in my opinion, very uncomfortable and, in some cases, just disappointing. 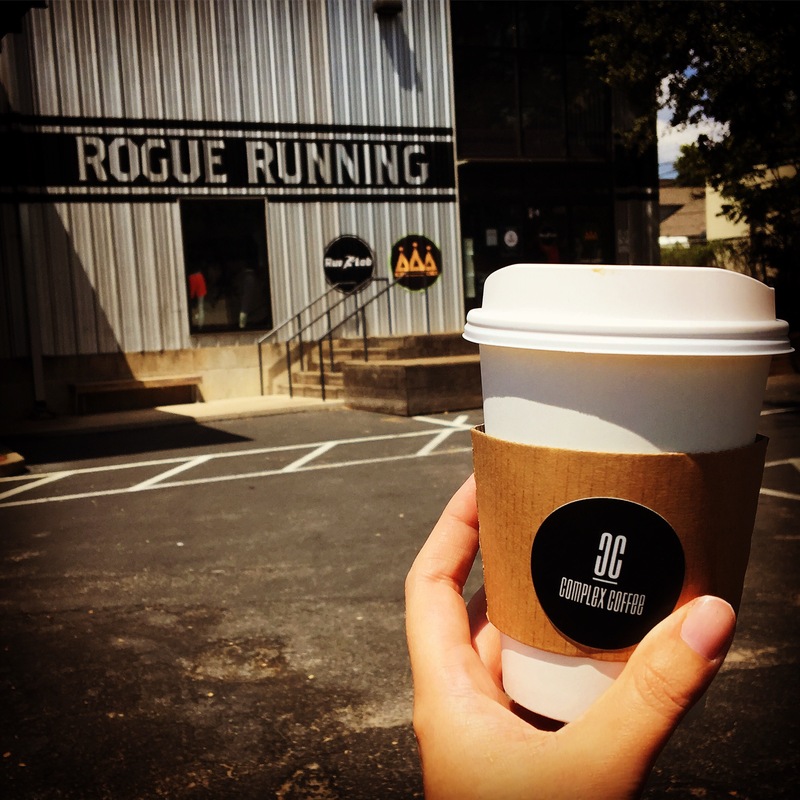 Let’s take my recent trip to Complex Coffee, which is situated inside Rogue Running, as an example. When I saw the sign saying the coffee shop was open, I was super excited as it’s on my way to the office, but that excitement turned to trepidation upon entering the Rogue Running building. In case you couldn’t guess it, I am not a runner, and I’m pretty sure the workers there could smell the laziness on me. They seemed nice enough and asked if I needed help, but as I moved between several racks of running gear, I couldn’t help but feel severely out of place and lost. The coffee bar itself was easy to find and is housed in a unique crate-like tower, the design of which I found very interesting and appealing. Unfortunately though, the tower was only large enough to house the coffee and food equipment, leaving all tables and chairs for patrons out in the capacious, brightly illuminated space that is the Rogue Running store. Despite some music playing from the tower, the sound was swallowed by the empty building, and when I ordered my drink, my voice echoed awkwardly across the space. While waiting for my cappuccino, I examined another area of the running store that was clearly designated for on-site fitness classes and immediately felt guilty for craving a danish with my coffee. It made sense to me that the coffee bar would be perfect for before- and after-class chats, but I couldn’t imagine ever wanting to stop at Complex Coffee just for the simple treat of grabbing a cup of coffee and a snack, especially when my drink was only so-so. And that leads me to what ultimately bothers me about these hybrid shops: the lack of identity. Of course when a sports shop is first established, the focus is on selling the sports merchandise and services. That is the original purpose of the store. The coffee service is often added later as a possible revenue stream that could increase traffic to the location. To make this work, the coffee business is made to fit into the sports store as opposed to having its own identity and goals. In effect, it loses many of the aspects that make coffee shops so special, such as drink quality and atmosphere. In addition, because the focus remains on the original money-maker of the shop, improvements and innovation don’t occur. So please, I beg of y’all, keep the sports and the coffee separate. It’s just good business practice, and coffee deserves better.